The American colonial wooden door traces its ancestry to France, England, Holland, Spain, and Mexico. 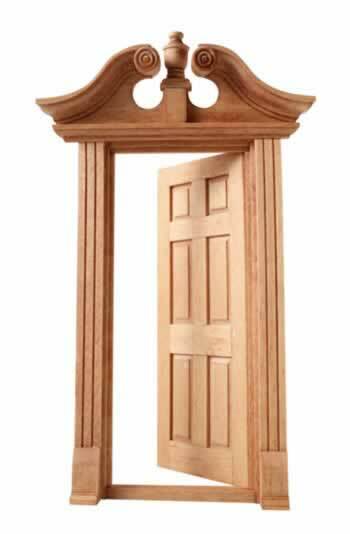 Fluted or non-fluted headers, leg columns, and thresholds (or saddles) are more than ornamental pieces. They frame your wooden door in solid, durable materials that add lasting value and high curb appeal to your home. Crafted from a range of wood materials and stains, your six-panel doors can match your theme to a tee. High quality wood doors can be custom made to complement Eastern Shore colonials, the French style of the Mississippi River era, or Spanish colonial architecture of Florida and the American southwest. Handcrafted or manufacturer-built wood doors can also fit your budget. Six-panel wooden doors remain one of the most-popular doors available today. Finish-trim carpentry from a specialist, along with the right hardware for the period, can make all the difference when it comes to durability and curb appeal.